Mary Cassatt was born in Pennsylvania in 1844. She was the fourth child of the five children born to the family. When she was seven her family moved to Europe. They wanted their children to understand European ways and the people who lived there. They traveled a lot and she had visited many countries by the time she was 10 years old. After four years they returned to America. In those days, women did not have professions, and there were very few women artists. Her family did not approve when she decided that she would become an artist. She studied first in Philadelphia. She happened to be in Chicago in 1871 when the huge fire broke out. She lost many of her paintings in that fire. She went to Paris to study painting. Her mother traveled with her to Paris and then she returned home and left Mary there to study. She met Camille Pissarro. 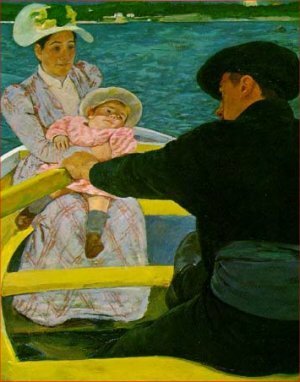 He taught her Impressionism, a method of painting where the artists used small strokes of unmixed colors to create an image. She once said of Pissarro that "he could have taught stones to draw correctly" because he was such a good teacher. She spent a lot of time at the Louvre Museum copying paintings of the famous artists. 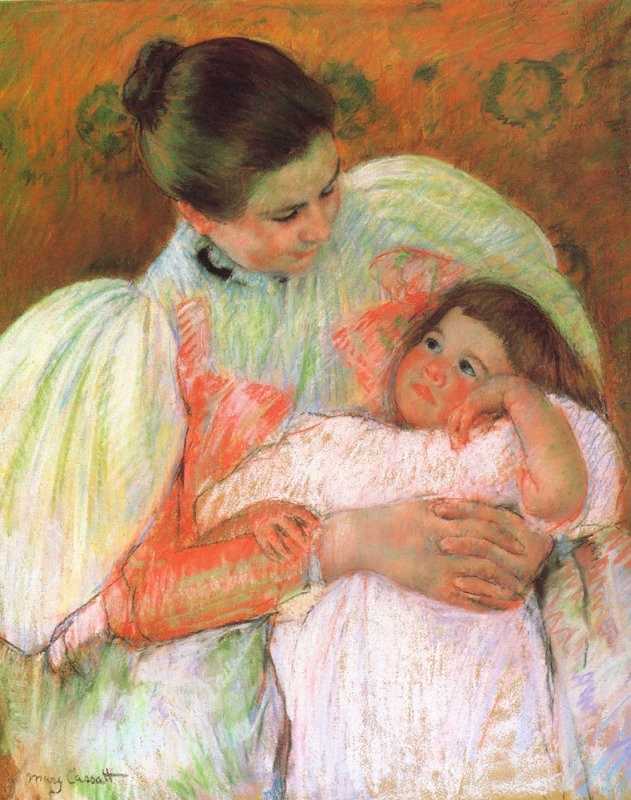 She admired the work of Edgar Degas, and was able to meet him. They became good friends. 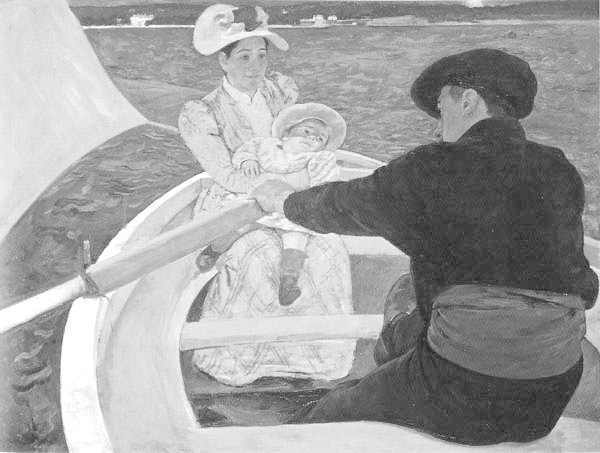 Once when the Impressionist exhibition failed to include him, she also would not participate. She was a great asset to the Impressionist movement both financially and by helping to get the works into American museums. Her family thought she should not be living in Paris alone, so in 1874 her sister, Lydia, came to live with her. Lydia was her best friend and sat and posed for many of Mary's paintings. Three years later her parents came to Paris to also live with them. Lydia became very ill and died from a disease. Mary missed her very much. Her parents became elderly and she cared for them, but she still found time to paint. 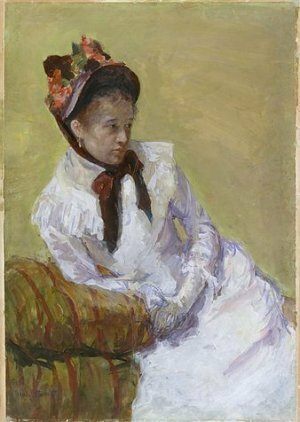 One of the more interesting and perplexing works of Mary Cassatt is her painting called Portrait of Mrs. Curry, Sketch of Mr. Cassatt. This is a double/upside-down picture. It seems she started a picture of her father, but decided to turn it over and make a portrait of a mulatto servant, Mrs. Curry. It once sold for $211,500. 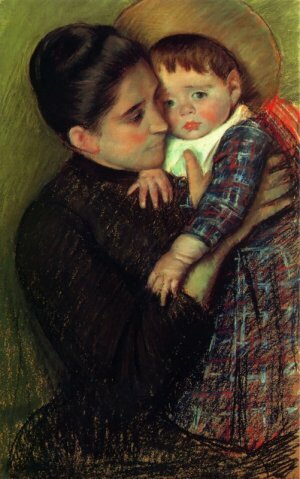 Though she never had children of her own, she loved children and painted portraits of the children of her friends and family. Usually the mother/child pictures were not of an actual mother with her child. She would pick the models she wanted to use for the painting and ordinarily it was not the mother's own child who was pictured with her in the painting. 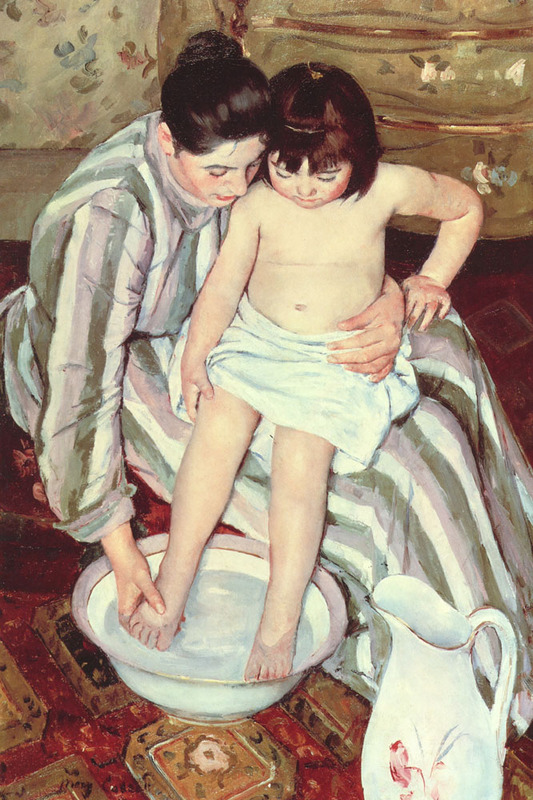 She became known as the painter of mothers and children. Three of her paintings are shown below and you can view more of her beautiful paintings through the links on this page. She lost her sight due to cataracts on her eyes in 1914 and was not able to paint during the later years of her life. This page displayed 188,471 times.